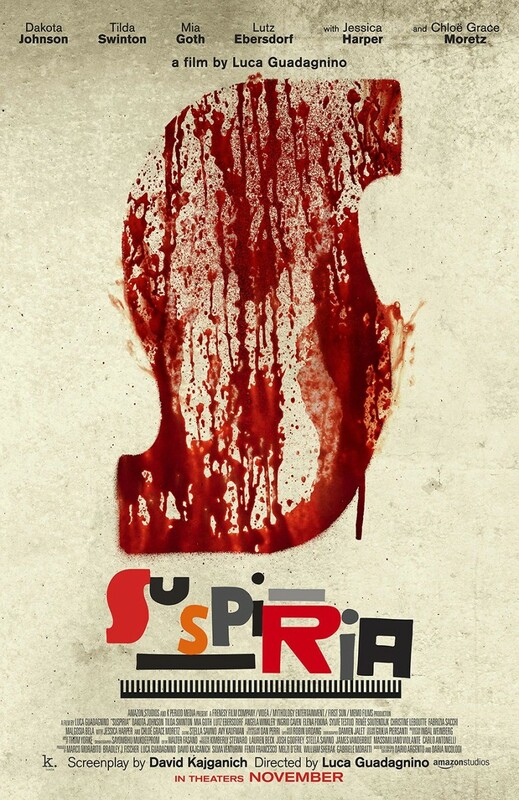 Dario Argento’s 1977 horror film Suspiria is a nutty barrage of sights and sounds akin to a particularly unhinged ghost train ride, centred around ambitious young Suzy Bannion joining a Viennese dance academy which she discovers is run by a secretive coven of witches with murderous plans. Now Luca Guadagnino’s remake retains the 1977 setting but relocates the story to a bleak, divided Berlin, with the school now right in the shadow of the Wall. Lord alone knows why, though. Guadagnino received much acclaim last year for his gay coming-of-age drama Call Me By Your Name, one of his few films not to have starred Tilda Swinton. Swinton is present and correct here alongside Dakota Johnson, her co-star from Guadagnino’s execrable A Bigger Splash (2015), one of the most patience-trying films of recent times. That doesn’t bode well and nor does the caption at the start of Suspiria which informs us that the film will comprise of six acts plus (gulp) an epilogue. Fair’s fair, there are some elements worth admiring. As the talented, inquisitive Bannion, Johnson acquits herself pretty well. The cast, which also includes Angela Winkler, Mia Goth and Chloë Grace Moretz, are generally very capable and do their level best with spindly material. There’s also the haunting score by Thom Yorke, not least its achingly sad piano theme which deserves to be accompanying a much stronger film. The problem seems to lie in the decision to take Argento’s original and turn it into a self-conscious work of art, as though a bit of OTT genre hokum wasn’t interesting enough in its own right in the first place. Guadagnino has described his film as as an homage or a ‘cover version’ rather than an out-and-out remake (though feel free to contact Northern Soul if you can explain the difference). At times it nods towards its 1977 forebear with inexplicably incessant rainfall, but manages to add nothing worthwhile. This movie takes a knowingly different path, with a subdued colour palate and a whispering soundtrack where the original was all day-glo overkill and in-your-face bombast. However, for all their potential, the raft of rich elements laid into the background – life beside the Berlin Wall and the crossing of the checkpoints, the militant violence of Baader-Meinhof, the spectre of World War Two, Bannion’s Amish upbringing – don’t amount to anything, because nothing specific, either in terms of theme or plot, is ever actually made of them. The film takes itself terribly seriously, and while the imagery is occasionally bold and striking, it gets carried away completely with an obscure hotch-potch of symbolism, often around the subject of mothers and motherhood, which is only really good for a quick, trippy dream sequence here and there. Argento’s film was hardly a laugh riot but it was delivered with a sense of showmanship which is sorely missed. 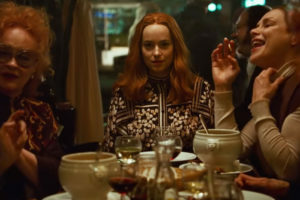 With a running time in excess of two and a half hours, Guadagnino’s Suspiria threatens to feel interminable as narrative threads lose their way and any sense of momentum or pay-off seems to recede. It aims to be grounded in reality with any outlandish moments kept few and far between, but there’s no disguising the fact that it’s still a barmy story about witches running a dance academy, a bit like The Worst Witch but with added choreography and mutilation. The earnest tone simply lays bare that innate daftness. There’s also the fact, now common knowledge, that two of the main roles are played by the same actor, though this goes uncredited and isn’t revealed within the film itself. This could be fascinating if the roles in question were deeply connected: does this imply they are two sides of the same coin, say? As they aren’t, it simply comes across as a indulgent wheeze, with the same sense of ‘but why bother?’ of so much on display within. Ambitiousness is a fine quality for a film, as is an attempt at imbuing it with dense, layered meaning, but ultimately the film will be judged on whether or not it succeeds. 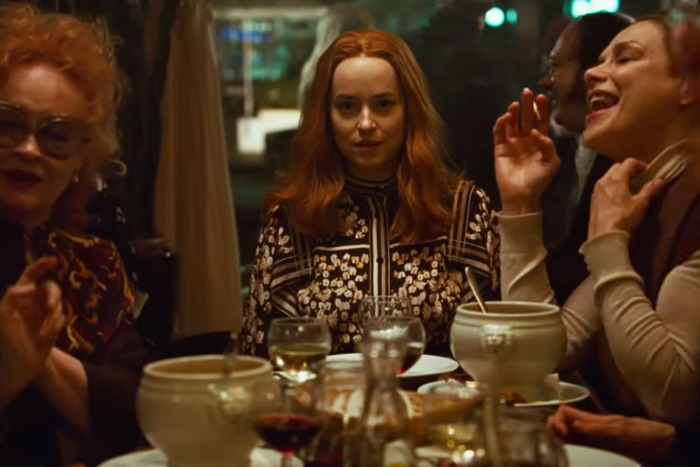 As a whole, Suspiria falters under the weight of its own pretensions. All told, the film poses the question ‘is it worth remaking a fun but lightweight horror film by promising to lend the material a whole new sense of depth?’, only to then answer it at length with a resounding ‘no’. 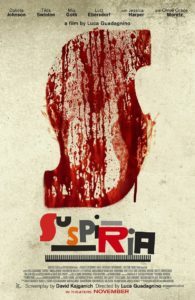 Suspiria is on release in selected UK cinemas from November 16.